Richard Van Donk was born in Stockton, Calif. in July, 1950. Warrior names: Kofukuryu (Happy Dragon), Mr. Happy & Yee Ha by Soke Hatsumi. Richard started formal martial arts training at the age of 17, informal at age 11. Master Van Donk is the Founder and Director of the Dynamic DeCuerdas Eskrima System based on the teachings of the late Grandmaster Gilbert Tenio, the IBDA/American Bujinkan Dojos (Ninjutsu) and Bushindo Martial Arts University operating world wide in over 80 countries with its International Dojo Headquarters in Middletown, (Northern) California, U.S.A. His wife, Linda, personaly trained with GrandMaster Tenio and is a Level 6 in the DeCuerdas System, she is also a Shihan Shidoshi (15th dan) in Ninjutsu and is the Assistant Director of Training for the International Bushindo Dojos. Besides being an inheriting Grandmaster of the internationally acclaimed Eskrima late DeCuerdas Grandmaster Gilbert Tenio (along with Richard Tenio- who is no longer teaching), Richard Van Donk is one of the highest ranking Bujinkan Ninjutsu Shihan (Instructors) outside of Japan (10th Dan in Ninjutsu (NinpoTaijutsu) / 15th dan in Budo Taijutsu from Grandmaster Masaaki Hatsumi) and an Grandmaster (personal student and Also has been awarded blackbelt levels or above in Karate, Jujitsu, Tae Kwon Do, Muso Tenshin Ryu Iaijutsu (yondan), Aikido, and Enshin Ryu Iaido and BattoJutsu (from Grandmaster Kenshinsai Machida). 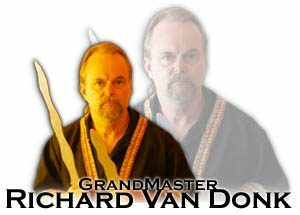 In 1996 and in 1997 the World Head of Family Sokeship Council awarded Master Van Donk with its most prestigious award of Grandmaster of the Year for his contributions to martial arts. He has been inducted into many Master and Grandmaster councils and has received countless awards. True DeCuerdas is a pure blade fighting system that is one of the rarest mother systems of Eskrima. DeCuerdas means to windup as in winding a watch (‘spring forward’) and has deep spiritual and philosophical roots as well as a very powerful weapons art. Master Van Donk was given the rare title of Master (Professor) in DeCuerdas Eskrima from the late Grandmaster Gilbert Tenio, who then passed his art down to Master Van Donk before his death making him the next designated Grandmaster of the Tenio DeCuerdas Eskrima System. Richard studied diligently with Grandmaster Tenio for 14 years and much of his training was received one on one. Grandmaster Tenio had mastered 19 different Eskrima styles and was world renowned for his disarming ability. He was a great master who is truly missed. GrandMaster Van Donk calls his system Dynamic DeCuerdas Eskrima. Master Van Donk is a personal student of Ninjutsu Grandmaster Masaaki Hatsumi of Noda city, Japan and has traveled to train with him at least twice a year since 1985 when he received his (Nidan) 2nd degree Blackbelt and Shidoshi-ho (Junior teaching license) directly from Soke Hatsumi. At this time Soke Hatsumi also made him a personal student in a special ceremony at Shihan Ishizuka’s dojo. In early 1987 Richard passed his 5th degree test in Japan in front of a panel of Japanese Shihan. At that time Richard was told he was only the 9th non-Japanese person to be awarded this rank in the art’s almost 2,000 year history. Soke Hatsumi awarded Shihan Van Donk his 10th degree Blackbelt Menkyo license on Dec. 2, 1995 (Soke Hatsumi’s Birthday) and his 11th dan on Takamatsu’s Birthday March 2000. Soke Hatsumi awarded Richard the rank of Junidan** (12th Degree blackbelt) on March 28th, 2001. Soke Hatsumi awarded Richard the rank of Ju-sandan*** (13th Degree blackbelt) on December 2nd, 2002 (Soke Hatsumi’s Birthday), Soke Hatsumi awarded Richard the rank of Ju-Yondan**** (14th Degree blackbelt) on April 2nd, 2004 (Takamatsu Resurrection) and his Menkyo Kaiden Ju-Godan***** (15th Degree blackbelt) on Dec 2nd, 2004 (Hatsumi’s Birthday). Master Van Donk has been responsible for pioneering the current ranking structures used by many instructors throughout the Bujinkan. 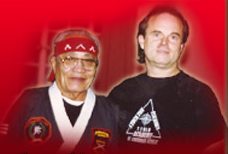 In 1991 Master Van Donk was awarded the Golden Dragon Medal from Soke Hatsumi for his pioneering efforts. Shihan Van Donk continues to travel the world training with Soke Hatsumi in Japan and at international events called Tai Kais. One of Richard’s great loves is the bladed arts and the sword became a passion and was the first reason to travel to Japan to train with Soke Hatsumi in Ninjutsu. Ninjutsu teaches Kobudo, real battlefield sword fighting skills. Richard has been given a 15th dan in Budo Taijutsu from Soke Hatsumi which includes much battlefield sword use. Richard also wanted to learn the presence of being taught in a formal Iaido (way of the draw) sword school and battojutsu (cutting on the draw and real traditional fighting skills). So early in 1990 he began training with Kancho (Head of Family) Kenshinsai Machida a renowned Japanese Sword Grandmaster of several systems. Richard received a Chudan level makimono scroll in Enshin Ryu Iaido and BattoJutsu, and a nidan level in Takeda Ryu Aikido in a short time. In March 2001 Richard was first non-Japanese person to be awarded the Shoden level makimono in Muso Tenshin Ryu Iaijutsu (universal heart sword school) from Grandmaster Kenshinsai Machida. In March 2003 Master Van Donk was awarded Chuden Mokuroku level (5th dan) in Muso Ikken Ryu Batto Jutsu from Kancho Machida. The highest rank issued to anyone outside of Japan. A beautiful handwritten densho scroll was also transmitted and given as well during a Mikkyo ritual ceremony. This balance of study between several sword systems was challenging and also very rewarding. As a note Kancho Machida can cut 10 rolled tatami mats in ONE cut. Yes, ten mats. Oh did I tell you he is 72 years old. heheehe there is still hope for us youngsters. Richard considers himself to be a perpetual student of life. Always questing the divine within everything and every one. This journey of self discovery has brought Richard all over the world to discover everlasting Truth, Consciousness and Bliss. On his path to wisdom and spiritual growth he went to every holy sacred site he could and found the wisest teacher, guru, mystic, priest, priestess, or shaman to share with him their knowledge. Richard spent time visiting such sacred places and people as the Pyramids & Nile temples in Egypt, Machu Picchu in Peru, Satgurus & Temples all over India, the Dali Lama, the holylands of Israel, Stonehenge & Glatsonbury & Avebury in England, Ephesus & Delphi & Instanbul in Turkey, Mt. Shasta, Ca., American Indian holy sites, Mikkyo Temples in Japan, Hunas of Hawaii, Central American ancient civilizations of Palenque, Teotihuacan and several others deep in the jungles of Mexico, Etc. searching and studying aspects of spirituality. Richard is now studying Mikkyo (and kuji kiri ) with a master teacher in Japan and Hamsa Kriya Kundalini Yoga from a Himalayan Nath Yogi (Richard is now certified and initiated at senior advanced teacher level- Swami Hamsa Achrya) Master Van Donk was first ordained as a minister in 1975 and one of the first empowered Reiki practioners in the United States (about 1976) from Hawayo Takata herself. Due to his tremendous amount of worldwide research Master Van Donk is considered a Philosopher by many. He has taken the best from all these sacred civilizations and teachers and formulated an Enlightenment processes called ‘Sourcing’ which he has taught worldwide. His core teaching are embodied in Uni-DynamicsTM “The science of being One”. Richard initiated a World Peace 2000 Breath of Peace at the start of the new millennium. He is now helping organize the World Peace Project IV with the Dali Lama and other spiritual leaders to be held in 2002. Danny a Golf Pro and Kimberly a college undergraduate Speech Therapy student. Richard started formal martial arts training at the age of 17, informal at age 11. Master Van Donk is the Founder and Director of the American Bujinkan (Ninjutsu) Dojos and Bushindo Martial Arts University operating world wide in over 65 countries with its International Dojo Headquarters residing in Middletown, California U.S.A. He is married to his lovely wife, Linda, a Shidoshi (10th dan) and Assistant Director of Training for the American Bujinkan Dojos and has two children Danny (Golf Pro) and Kim (Speech Therapist College student working on her masters).